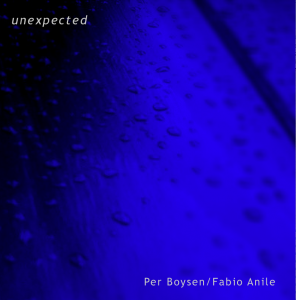 Unexpected – improvisational live album released! This album is a live recording of a musical duo improvisation session that took place in Rome on June 5 2009. Fabio Anile plays the Piano and the Synthesizer and Per Boysen plays the Alto Flute and the EWI (Electric Wind Instrument). Both musicians simultaneously play also interactive electronics, particularly utilizing the technique known as Live Looping. Exceptions are two tracks that were recorded later as a studio based long distance collaboration: Counterpoint (4) where Per plays the Chapman Stick and Bird’s View (7) where Per plays the Electric Guitar while Fabio doubles on Shakers, the Cajun and the Thelevi. Album and track artwork by Fabio Anile. Unexpected is digitally distributed all over the Internet, but I would advice anyone to check it out at Bandcamp because that’s the only digi music web shop I know of that allows specific artwork for each song of the albums. After having my new instrument, the Chapman Stick, for five months I finally decided to shot a video of it. What makes the Stick so fun to play is that you can use both hands more or less as “two musicians that jam together”. The playing experience is very open and creative. Quite different compared to most ordinary instruments that force you to train multiple body parts until they become one unified performance machinery. Stick playing rather puts your brain into multi tasking mode and calls for a split vision attitude. Another thing I like with the Stick is the powerful live sound design options you get by having two fretboards going out through separate outputs – meaning you can treat them with two different effect chains. I plug those two outputs into a laptop running Mainstage. 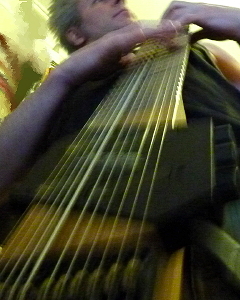 The Chapman Stick totally rocks!!! I’m learning a new music instrument here, The Chapman Stick. It’s so fun because on the stick you can play both bass, comping chords and melody lines at the same time. The instrument has twelve strings divided into two groups of six and each group has its own set of electro magnetic pickups and output. The Stick was invented by musician Emmet Chapman in the late sixties to be used by himself as his “custom instrument”. However, many folks that heard him play also wanted sticks so Emmet started manufacturing in -74. I feel honored having an instrument actually built by the inventor. Thank you, Emmet! 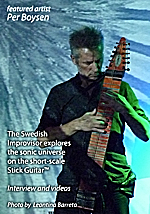 Here’s where you can read more about The Chapman Stick. Epilogue: Below is a quick video I recorded as a freshman on the Stick. I will soon upload something more exciting, as I’m slowly rewiring brain to improve its skills as the conductor of the “two independent hands” orchestra.